he rattles off the entire South Indian Dinner Menu, seemingly an impressive feat but really not. South Indian Dinner is essentially the same as breakfast with small variations. However, because the Indians eat so late at night and have such a large midday meal I have come to appreciate the simplicity of dinner both in size and complexity. The waiter comes almost immediately and I decline looking at the menu and happily order a masala dosa. 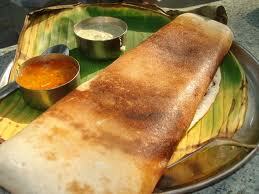 Masala dosa is perhaps the most famous South Indian Dish. This thin, fried, crepe-like rice cake has the slight taste of fermented rice and is served with the ubiquitous Kara (Red chilli) and Tenga (Coconut) chutney as well as this delicious spicy, curried potato based vegetable dish. You use the Dosa to scoop up the vegetables, dipping the ball alternatively into the chutneys and washing it down with a sweet lime soda. As I am looking around the restaurant for something to amuse me I catch sight of a table with a Western couple and my eyes light up. Ahh. Foreigners. And from the perplexed looks of the waiters, the slightly overwhelmed looks of the Foreigners and their sun burnt faces they look like Newbies. Excellent, guaranteed amusement for the next 15 minutes at least.See one thing you have to understand and learn as a traveler in India is to let go of the western sense of food culture. It is not that Indians do not have a food culture, they do, however it is absolutely contradictory and quite incompatible with western food culture. And when the two meet….well….. The Foreigners (German or at least Scandinavian I assume based on the very unflattering cotton pants, khaki colors and Birkenstock shoes) have gotten their menus which tattered and dusty look like they haven’t been used for months. The waiter in the last 3 minutes has been over twice already to ask for their order. “We will order some drinks first” The female says (lets call her Gertrude). Oh excellent, this will be hilarious. The waiter takes the orders but continues to stand by their table awaiting their meal order. The man (let’s call him Dieter) subtly tries to signal to the waiter that he wants some more time with the menu which confounds the waiter even more. The waiter tries to help “DosaOnionDosaMasala DosaIdliPuriVeda….”upon which Hans-Dieter shoes him away, asking for more time. Now it is not entirely unjustified that they are taking so long to look at the Menu. It has multiple pages and probably 50+ items which include anything from North Indian Specialties like Alo Gobi and Palak Paneer to Chinese Fried Noodles and Western style Pastas. It is quite a mystery because on any given day they will not actually be able to serve (let alone cook) any of those dishes as they don’t have the proper ingredients, knowledge or energy. Similarly, why any Westerner in South India would go to a South Indian Restaurant and order Pasta!!?? Which is guaranteed to be overcooked, over spiced and generally just BAD is beyond me. As a rule of thumb for traveling anywhere but especially in India – the only way to survive is to do like they do, eat when they do and eat what they do otherwise you are pretty much guaranteed to see more of your cheap hotel bathroom then of the actual country itself. The waiter by this time has returned with the cola (further proof of their Germaneness in my opinion-there is this urban myth in Germany that coca cola will cure stomach problems, especially while travelling and many Germans I know will religiously drink one every day when abroad). “What would you suggest?” Hans-Dieter asks, clearly trying to elicit some response from the waiter aside from his slightly confounded look. This, however, confuses the waiter even more it seems. Waiters here don’t suggest food and rarely will a restaurant have a “speciality”. They make what the people want and people know what they want from the get-go. Taking time to choose and browse, be it clothes, books or food is quintessentially un-Indian. “DosaOnionDosaMasalaDosaIdliPuriVeda….” He states, pointing at the first page of the menu. “No sir, also don’t have….we have dosa or idli-very good. Which one you want, DosaOnionDosa,Masala Dosa…”. The waiter is back talking to his other waiter-buddies which by this time have been watching the spectacle from the corner of their eyes (read standing 2 meters away staring with expressionless faces).They are laughing good-heartedly which is a good sign. It means that instead of assuming Gertrude and Hans-dieter are purposely being rude, they probably assume that they are just slow, difficult and a bit special. As we leave the dining hall night has fallen. Full of Dosa-goodness the driver and I go to the neighboring stall for a post-dinner coffee before heading back to the madness of Chennai. I can see from here that Gertude and Hans-Dieter have finally relented, ordered two Dosas and seem to be complementing the waiter on the food. Success in South India,it seems, tastes like Dosa.